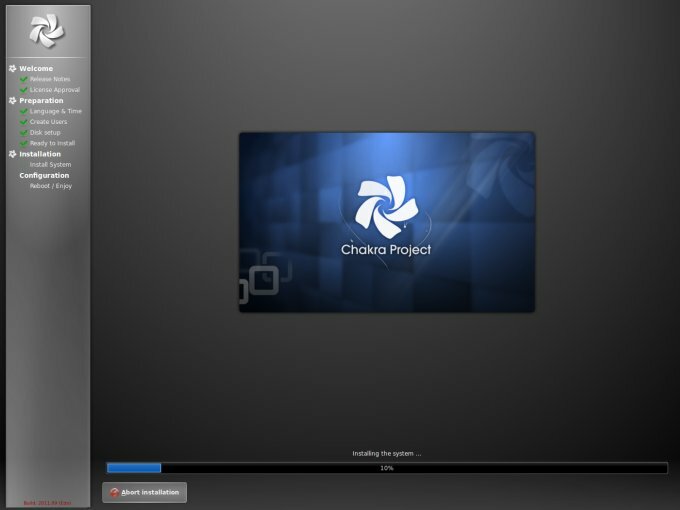 Two distributions that I have been most asked to review are Arch Linux and Chakra. And the reason I have so far refused to do so is the relatively high level of knowledge required to operate them. Think of Slackware, turbo mode into Gentoo, then add some. Supposedly, Arch Linux is good and stable and light on the system, but it takes time working out and taming, or as we say in technical parlance, why bother. But Chakra, as it turns out, is unto Arch what Sabayon is unto Gentoo. All of the horrible geekiness is taken away and you have a simple and friendly desktop. Well, today, we will find out if this is true, as well as satisfy the needs of dozens of people who have begged and yearned that I take Chakra for a spin. Now, I did dabble in Arch, so my belief that it has no place in the gentle hands of common users still stands, as well as my conviction that the highly technical audience in love with this distribution does not need my confirmation for their love and conviction. But Chakra could be a different story altogether. Chakra would not boot from the USB drive, so I had to go classic with this one. 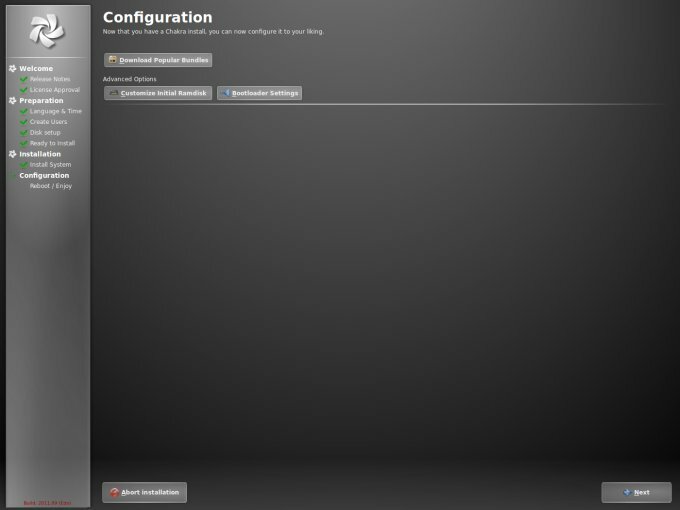 The boot menu offers several options, including live session with or without proprietary drivers and installation. I decided to try the live session with all the extra stuff first. 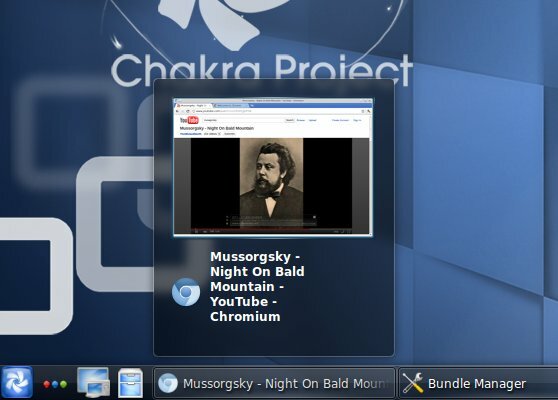 Unlike most distributions that offer several desktop environments, with the Chakra project, you get more sort of a Highlander approach - there can be only one. Hence, KDE4. Smooth and polished, it ran decently on my test box six years of age, a T60p machine with a dual-core 32-bit processor, two gallons of RAM and a cripplozoid graphics card. 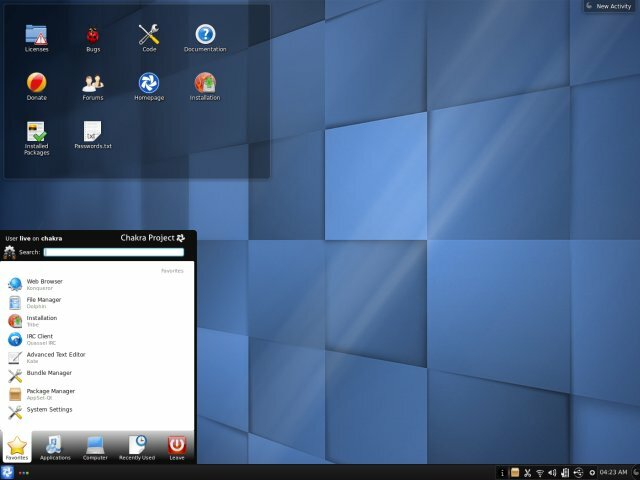 Much like Mandriva a week back, Chakra 2011.08 delivers a 50% satisfaction. MP3 playback is there, but you won't get any Flash. This is ok I guess, but if you're going for one proprietary plugin, why not offer them all. Oh, Bangarang looks neat. 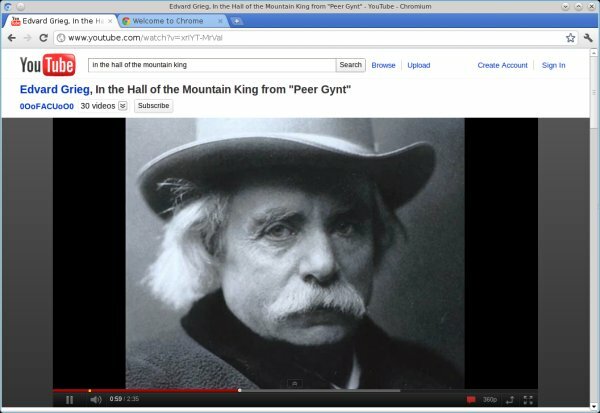 In the live session, Konqueror is the only available browser, so this might annoy you a little. 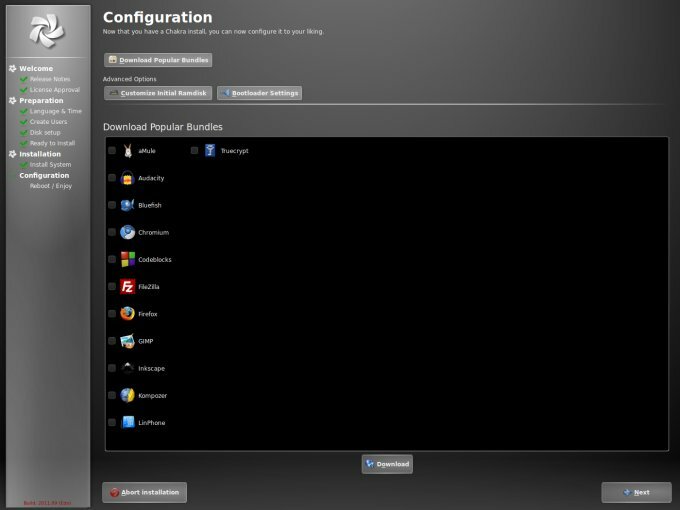 Later on, you will have the option to install other browsers, if you choose. Age seems to be the limiting factor when it comes to powering the built-in desktop effects on top of this old laptop. 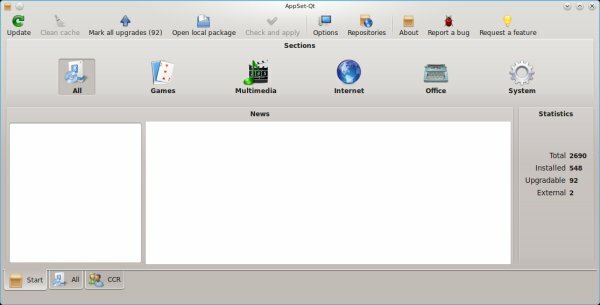 But it did work in several distributions, including a splendid show of performance on Kubuntu, so I expect no less from the rest. While some basic stuff like glow, translucency and windows decorations did show up, fancier, more complex plugins could not be turned on. This is a shame, really. Now, I might be expecting too much, but I see no reason why I should chuck the machine into the trash bin just because some distributions fail to support old and weak ATI cards. And let us not forget the mantra that says your older hardware ought to be ideal for Linux. This is not specifically vectored toward Chakra, but this distribution fails the same test like most others. This term may sound annoying after you've read my Gnome 3 review, but in KDE, it actually makes sense. While I'm still trying to figure out what activities do and how they should be used, they strike me as interactive layers for your desktop, which allow additional use that is normally reserved to dedicated programs. Only here, you get all of those living and breathing on top of your wallpaper, which is a nice and useful feature, especially if you are dreaming of tablet-like use some day in the future. Yet another cool thing is, you get lovely previews of application windows. I don't recall seeing this much around, but it is definitely a nice, soft and non-geeky touch for this rather technical product. Now, the Flash playback in Youtube definitely belongs after the installation, so I might be spoiling the surprise, but it demonstrates well the visual elements. Overall, the live session was stable and useful, with enough functionality and eye candy to please newbies as well as power users. You have your share of simple, click-to-use programs, but you can also delve deeper if you so desire. 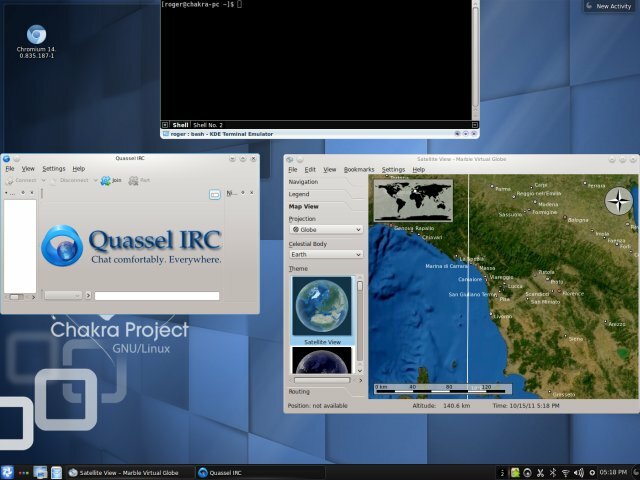 Charka's KDE implementation might not be as exhilarating as some, but it delivers a mature, conservative and practical environment across the board. Very good. 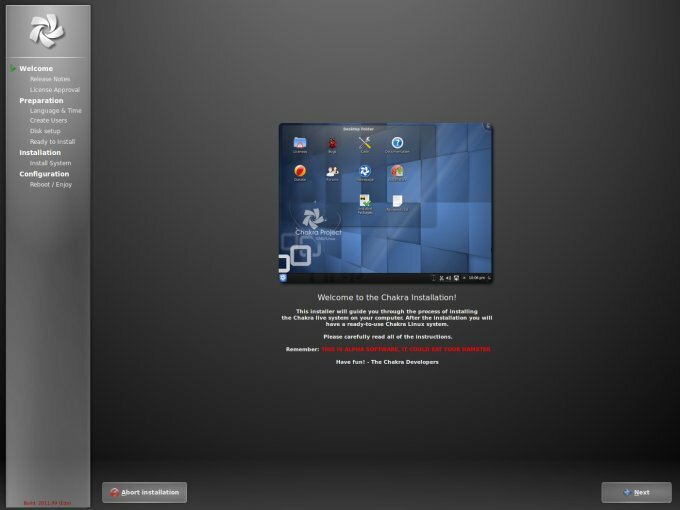 Yes, I dare say that Chakra comes with one of the best, friendliest installers I have seen in a long while. It sure is the most interesting and unique. Some small elements require polish, but the overall experience is one step ahead of the rest. It somewhat reminds me of what Pardus did in their 2009 release, with a bit of openSUSE formality. The installer launchers is full screen, similar to Kubuntu, to keep you from being distracted. You are warned that you are handling alpha software, although I'm not sure how an official release can be alpha, but so be it. 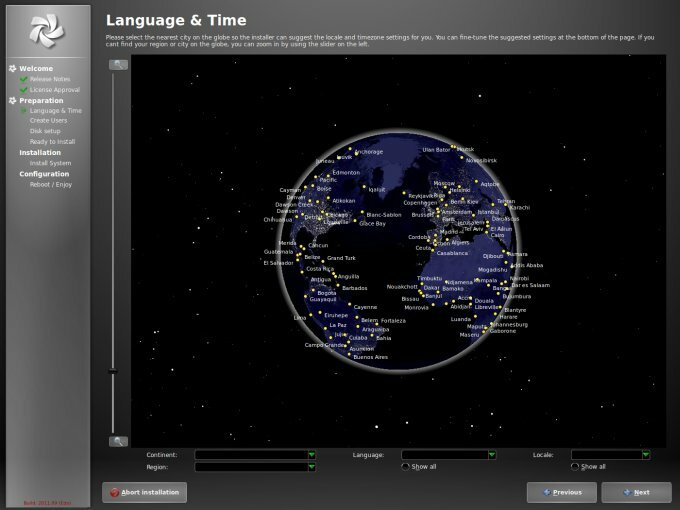 Next, you get a full page of release notes, and then you have to configure your time zone and language. Again, unlike most other distributions that present you with a world map, you get a rotating 3D globe a-la Marble. The only problem is that if you choose any specific city, your language and locale will be preselected, not necessarily what you need. You will have to mark the little checkbox below to get all of the options and override the fairly localized choices. User setup is also fast and trivial; no root. The disk partitioner is also setup in a smart, elegant manner. The options are clear and visible. You might even argue that the installer is too simplistic in this regard. If you want, you can launch the Advanced partitioning wizard, but you will have to reselect all of the mount points and filesystems, because it will mount the devices. One thing that ought to be displayed is whether you choose to format the filesystem, as I was unable to see the indicator for that. After this, the installation begins. Once this step is done, you will have the ability to configure your system some more, including downloading popular software bundles, configure the bootloader and customize the initial ramdisk. What did baffle me was the bootloader setup. It's called BURG, and I'm not familiar with it. Second, this did not quite help me understand if GRUB was install by default or I had to install BURG to get Chakra to load. This is the one weak part of the installation procedure, which was otherwise spotless. Well, since this is a test, I selected the install option and clicked next. This turned out to be a wise choice. On reboot, I had a boot menu. It read GRUB, but it looked and behaved like no other GRUB. The menu theme was designed like a game logo for Commodore 64, but it did have the Windows 8 dual-boot entry there, so all is well. Opening your chakra probably has a deeper meaning that running a Linux distro, but let's see what gives. So far, things were looking ok. I was disappointed with the desktop effects and partial multimedia support, but given a super-stable and rational system, I was able to swallow these down and focus on productivity. The first boot revealed a few interesting facts. 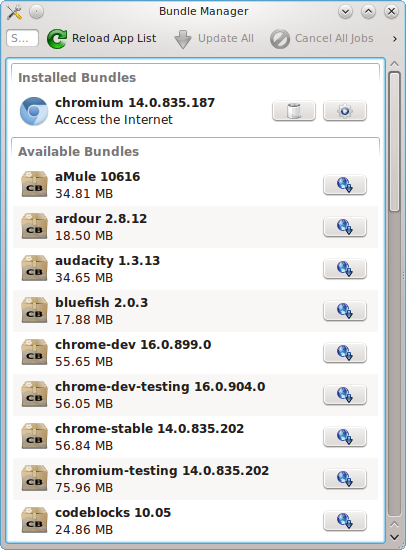 First, Chromium was installed, but not Firefox, despite choosing so in the bundle selection. 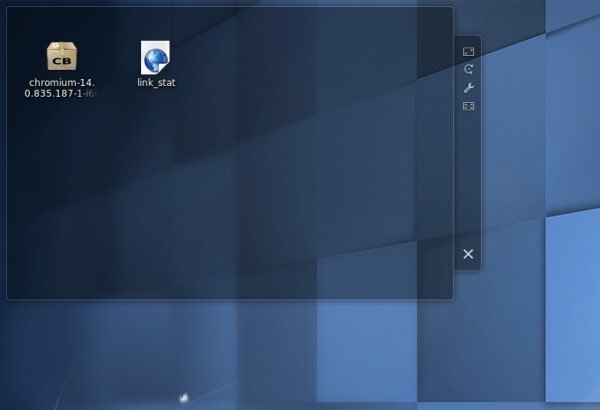 Moreover, the desktop plasmoid was showing Chromium with a weird icon that was fixed upon first launch. Speaking of the first launch, the search engine choice window pops in the right corner, half-hidden, so this could confuse users. Indeed, after the first use, the icon sorted itself out. But I'm wondering about that file called link_stat, which turns out to redirect nowhere. Must be an installation leftover or something. Finally, Chromium comes with its own private version of Flash, so Youtube will work as you expect it, but you won't get it just yet in other browsers. So it seems the initial bundles did not quite install as I expected, but we'll see more soon. Let's begin with this item. 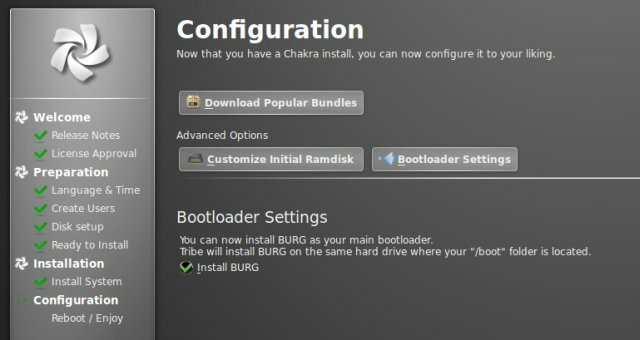 Chakra comes with a unique set of package management and update tools. You have AppSet-Qt, which reads upset, probably intentionally, for your standard work, which does what you expect. What more, it comes with interesting perks, like displaying the home page of the selected package. If you browse for popular content, you won't find it here, so you might be upset [sic]. 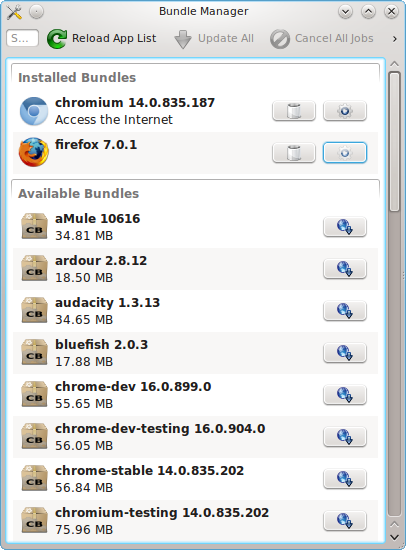 There's another tool called Bundle Manager, which has all the goodies you want and need. After powering and using it some, this time Firefox installed properly, although neither Google's, nor Mozilla's browser showed in the system menu. Chakra does not pack much. The default arsenal is fairly minimalistic, although some programs make you wonder about the developers' choice. For example, you get Marble, which I love very much, but I think having some office programs would be a better idea. Konqueror is the browser of choice, you get some IRC chat software, a single media program we saw earlier, GwenView, Yakuake, a handful of K programs, and that's all. You will have to work your package manager or the bundle manager somewhat hard, but at least you get an option to do much of it during the installation, plus you get a lot of new, bleeding-edge software. 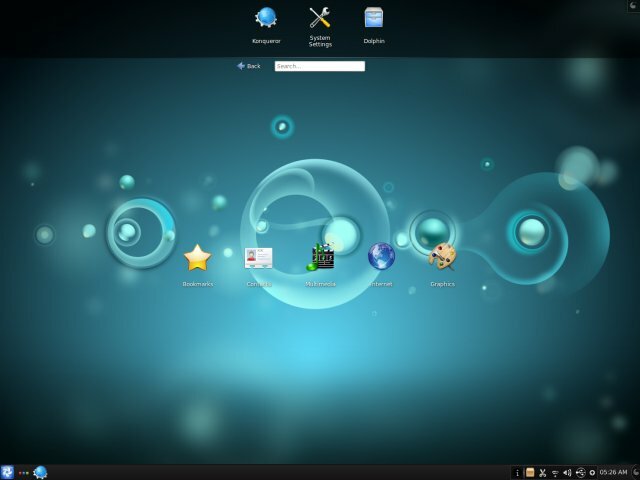 For example, you can download Firefox 10 alpha. Speaking of Firefox, the default theme used in this distro is a weird combination of KDE and GTK fallback themes, so it looks stupendously ugly. Might be a visual glitch or a bad integration, but this is one item that stands out in an overall high-quality execution. Overall, the system behaved well. 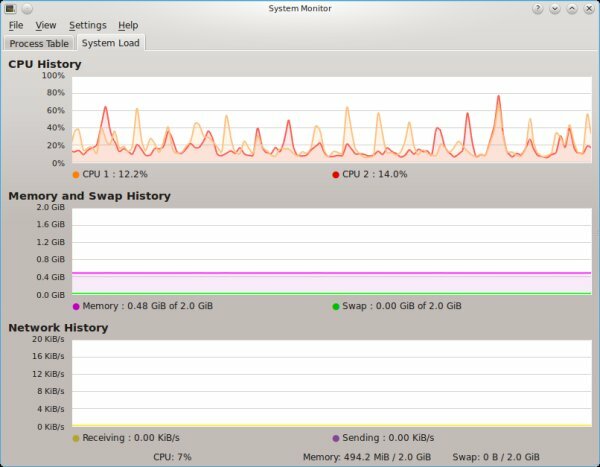 There were no crashes and errors, the KDE session was utterly stable. Suspend & resume were fast. On idle, Chakra demands some 0.5GB of RAM, which is a hefty sum, especially considering that there's no proper 3D card in use. Not sure about the CPU spikes, but the system was rather responsive. There were not that many. Very few, in fact. Overall, the level of integration and polish in this distribution is surprisingly good, indicating the project must have a very meticulous QA team. Moreover, since this is a WARP 9 geek distro, the effect is even more astounding. Now, compare this to, say sidux and see the difference. However, one thing that did annoy me profoundly was the Touchpad. There was no option for me to disable the Touchpad while typing, which resulted in lots of anger on my behalf as my thumbs brushed the surface and defocused the cursor. I wonder why the option is grayed out, but I don't like it. Other than that, I did not like the lack of desktop effects, the initial handling of Firefox and Chrome, the bad Firefox theme, the inconsistent Flash experience, and the separation of popular content from standard updates and packages. Chakra is a really amazing project. It is a multi-layered surprise. First, it's based on Arch and yet, it hides away all of the difficult and geeky. Even when you encounter errors, like trying to run both package manager and update manager at the same time, the error messages are useful. Then, the visual quality, the integration and the finish are great. There are some rough edges, but far, far less than what I've expected and far fewer than what ought to be the norm for a young, fledgling distribution forked off Arch no less. The installer is superb, too. You get a serene, mature feeling using the operating system. You transcend beyond the trifle fiddling with unimportant details and focus on style, elegance and productivity. There are some issues, including 3D stuff, which is not Chakra domain solely, some installer clarifications, plus the bundling of packages and the dual existence alongside the classic package manager, all which need polish. But the problems are relatively small, innocent and welcome improvements to a solid, robust base. I must admit I'm honestly shocked. I have never expected this result. In terms of relative quality and expectations, Chakra managed by a quantum leap. Still, it is not the best offering on the market and must work hard to iron out the little bumps and crinkles. But with no major roadblock and only small items remaining, the future releases could really become the best KDE distro around. At the moment, 8.5/10. Beautiful. Must try.